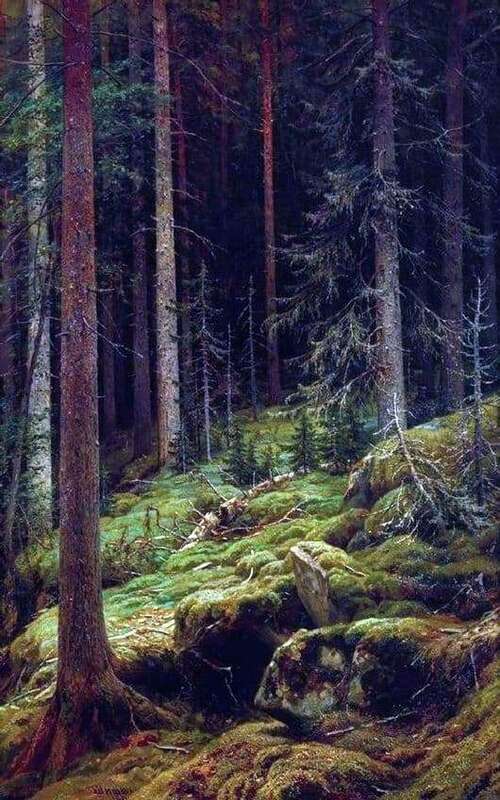 Discarding superfluous prejudices and distract from the rather harsh name – “Derby”, it is worth noting that this is one of the most gentle and delicate works of Shishkin. The canvas is maximally imbued with a certain mystery and unidentifiedness, which is caused precisely by the secrecy of the forest nature and all its inhabitants. A wilderness in which the artist was able to notice and hear the growth of conifers and the diffuse soft music of forest existence, which carries something intimate, invisible and poetic. The viewer can see large wild stones that are overgrown with moss. The artist also accentuates an open glade, on which you can see several small fir-trees, which gently and gently press against one another. Around deep darkness, where due to the large number of dark trunks of mighty trees, there is no way to break through not a single ray of the sun. Here is the realm of silence, and is dominated by a thick and rich smell of pine needles. Even a bird that can fly here by chance can be found much less often than in any other place. Due to the fact that very seldom not only does sunlight penetrate here, but even animals. Because of this, dry branches, as if in the last hope to reach up to the light, due to the fact that the darkness of this thicket is trying with all its might to muffle their growth. The master thus shows the viewer a natural selection and a harsh struggle for survival, in which the strong defeats the weak. This could contribute to the very mood of the master, along with his difficult fate. The picture is literally saturated with the special, magical life of the whole forest. The picture requires a slow and unhurried inspection of all the details, for full penetration into the picture and understanding of the emotional presentation of the artist. Unimaginable lace branches, which are intertwined among themselves personify the web of life events, which are described in the picture by a staunch realist.